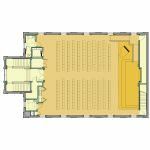 Our involvement with the First Parish Church spans more than seven years and three different building committees. It began as a feasibility study and schematic design for the renovation of a 17,000-square-foot facility, and has progressed to construction of several of the five phases. 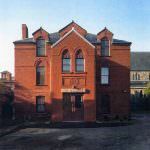 The church building is a significant example of George M. Harding’s high Italianate style, with the majority of its original fabric of the exterior and interior intact. Phase 1 is best referred to as “utilitarian restoration.” Building movers held the entire sanctuary in place with steel girders while construction was undertaken for a new foundation. Granite foundation blocks measuring 10 feet x 3 feet x 12 inches were removed, documented, and cleaned. A new concrete foundation was constructed to support the building and the granite blocks were relocated to their original position. This restoration resulted in the owner’s ability to reclaim underutilized basement space. The basement cellar sashes were replaced with new wood windows. With the introduction of a light well flush with the grade, new openings with metal windows were provided below grade. The final appearance maintains the historic integrity and provides functional and naturally lighted space in an otherwise unused area. Phase 2 will be the restoration of the Sanctuary. This project includes relocating a highly ornate wall of woodwork. We worked to resolve this sensitive alteration and explain it to the congregation by constructing a detailed model of the Sanctuary with moveable pieces. 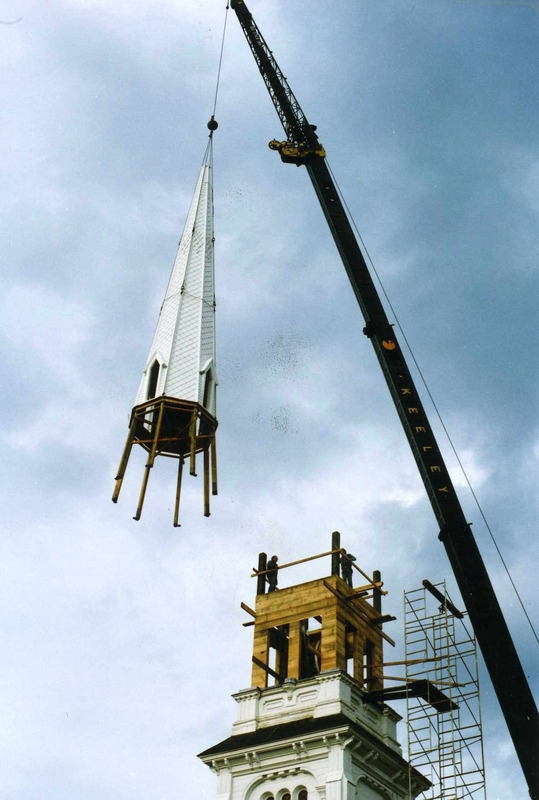 Steeple reconstruction and replacement of the organ are related phases conducted by the Building Committee.